I’ll confess, come summer time there’s a soft spot in my heart for cold salads. When I was a young ‘un my mom had a simple yet much-loved pasta salad recipe that was her go-to dish for summer picnics, BBQs, and potlucks. It was easy to make and held up well to the brutal heat of Texas summers – no chance of spoiled mayo in this salad. Back then I’d eat my way around the vegetables but today I’m happy to say my palette has improved and I enjoy them as much, if not more, than the pasta.As a part of my ongoing quest to bring more whole grains into my family’s diet, I’ve been looking for ways to make my favorite pasta salads pack more nutritional bang for the buck. While substituting whole wheat pasts for traditional pasta is one quick substitution, I’ve been looking for different bases entirely. I’ve previously experimented with quinoa and but wanted to try something different. Luckily, I’m not the only one questing for more nutritious grains, so there are plenty of options to choose from these days. For this round of tinkering I went with bulgur, a parboiled form of whole wheat that is dried and coarsely ground. It’s a very common ingredient in Middle Eastern and Mediterranean cooking and many Americans first come into contact with it in tabbouleh. While some of the bran is removed from the wheat to make bulgur, some remains making this grain a great source of fiber and protein. 1/4 c. of dried bulgur (which becomes about ½ c. of cooked bulgur) has about 120 calories, 6 grams of fiber, and 4 grams of protein. When you bulk it up with fresh summer vegetables, you can create a fiber- and nutrient-rich dish that really sticks to your ribs. While I was changing up the cold salad of my youth, I thought it might be fun to do something a little different with the vegetables too, so I grilled them before tossing them with the bulgur and the vinaigrette. The result is a salad with a little more depth of flavor that you can start the night before if you so desire and toss together up to four hours before you plan to serve it. Make this simple yet nutrient-packed salad ahead of time to serve at an al fresco dinner party, at a picnic, or as your contribution to a potluck. Combine the bulgur, water, and salt in a small sauce pan. Bring to a boil over high heat, cover, reduce heat to low and simmer for 10-12 minutes or until all the water is absorbed. Slice the squash into 1/4 inch. slices. Remove the seeds and ribs in the bell pepper and cut into 2 inch wide wedges. Brush both sides of the squash and bell pepper slices with olive oil. Sprinkle both sides with salt and pepper. Grill the squash and bell pepper slices until tender, about 7 minutes per side. Spread the bulgur and grilled vegetables onto a rimed baking sheet and refrigerate until cool, about an hour. Chop the cooked vegetables into 1/4 inch pieces. Toss the vegetable pieces and bulgur in a medium bowl until well mixed. Set aside 1 Tbsp. of the vinaigrette. Mix the remaining vinaigrette with the bulgur and vegetable mixture. Refrigerate for at least 30 minutes and up to four hours. Just before serving, add the reserved vinaigrette and stir to combine. Be sure to prepare the bulgur according to package directions as they may be different from brand to brand. 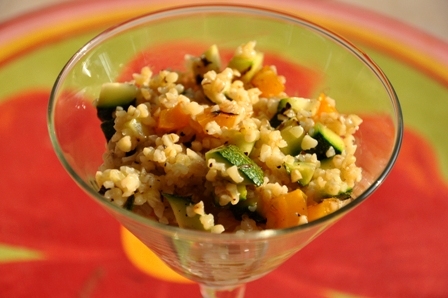 You can cool the bulgur and grill the vegetables the night before you make the salad. Don’t cut the vegetables until you’re ready to mix the salad. If you are short on time, you can quickly cool the bulger and vegetables in the freezer; they’ll take about 15-20 minutes to chill. You can use any combination of grill-friendly summer vegetables that you’d like. Red onions would do nicely as would asparagus. Pick whatever looks best at your market. You’ll need about 12 oz. of vegetables total. Instead of making your own vinaigrette you can use a high-quality purchased vinaigrette instead. Be sure to read the label to avoid excess salt or corn syrup which will take away from the flavor of the vegetables. If you can’t find bulgur or don’t like it, you can substitute quinoa, couscous, or even rice for the base of the salad. Add 8 oz. of cold cook chopped chicken breast or pork tenderloin to this mix to create a one-dish summer entree. Hello admin, i must say you have hi quality posts here. Your website should go viral.